Have you noticed all the fun and unique things people are doing at weddings? Like candy bars or signature cocktails. If you’ve been on Pinterest at all you’ve probably seen dozens of wedding pins. There are so many ways brides and grooms are making their weddings totally unique to them. My client Courtney wanted to help make a very special “guest book” for her friend’s wedding in the form of a signature wedding quilt! Isn’t this quilt beautiful? The golds, reds, and blacks all look wonderful together. Courtney took all of the solid gold blocks to the wedding reception for guests to sign. Guests were encouraged to write notes of well wishes and advice for a happy marriage. If you want to make a signature quilt for someone I highly recommend getting a permanent fabric marker like any of these. Sharpies mark the fabric, but they don’t glide over the fabric easily like a fabric marker will. 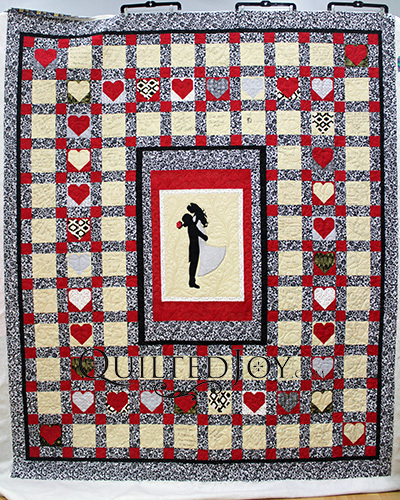 To quilt this signature wedding quilt, Courtney wanted most of the quilt to be a simple edge to edge design. Each of those signature blocks needed some quilting just to keep the quilt stable, but we don’t want to distract from their kind messages. She chose a sweet pantograph with hearts and loops. The center of the quilt needed something a little more exciting to highlight the beautiful applique. We decided I would add a custom treatment to the quilt’s centerpiece. I love that these feathers have a fresh modern vibe that’s perfect for a young couple. As an added bonus, the curling Nemeshing feathers look a little like the flourishes in the bride’s gown. To finish the center block I added swirly hearts to the larger red sashing and a curling design in the smaller sashing. You can click here to find a video tutorial for the curling sashing design. I had so much fun quilting Courtney’s signature wedding quilt. It’s absolutely beautiful and I have no doubt the newlyweds will cherish this special quilt! Previous post: Join Me for the FREE APQS Road Show on December 1!